The most common hoof complaints are often caused by external factors, and poor hoof hygiene can allow relatively minor conditions such as thrush and crumbling hooves to progress to a state when the hooves become difficult or impossible to shoe. Other conditions may require quite invasive work leaving the soft parts of the hoof unprotected and exposed. 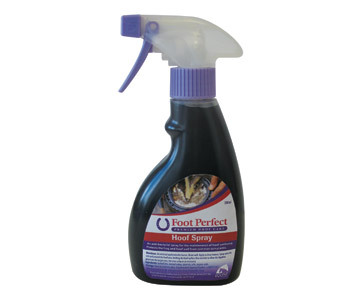 Foot Perfect Hoof Spray is a natural, anti-bacterial spray for the maintenance of hoof wellbeing. Used and endorsed by farriers, it is recommended for a whole host of hoof complaints to cleanse the hoof and sole. The specially designed bottle is easy to handle and the liquid formulation allows the active ingredients to penetrate all the cracks and crevices for optimum results. Shake well before use. Apply to clean hooves. Spray onto the sole and around the hoof area, holding the hoof up for a few seconds to allow the liquid to penetrate the targate area. Use once a day, or as necessary. There are currently no questions for Brinicombe Equine Foot Perfect Hoof Spray - be the first to ask one!